Editor’s note: In 1995, devastating floods compounded an already dire economic downturn in North Korea due to the collapse of the Soviet Union and the resulting energy crisis. 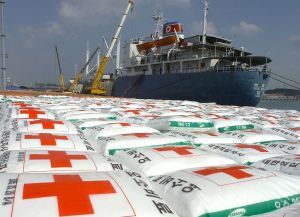 After negotiating quietly with Japan and South Korea for emergency food shipments, the DPRK government issued a general call for international food aid in the fall of that year. The World Food Programme (WFP) issued its first appeal for food contributions and opened a small office in Pyongyang in 1996. The first major contributions were received by NGO donors, followed by more massive bilateral and multilateral food aid. Therefore, 2016 is considered the 20th anniversary of humanitarian assistance to North Korea, even though in-country programs by NGOs would follow a year later. An office for NGOs within the WFP Pyongyang operation (Food Aid Liaison Unit or FALU) was opened in spring 1997. European NGO programs under the European Union umbrella began in the fall of 1997. It has now been 20 years since the first time that a serious effort was undertaken to provide humanitarian aid to North Korea—an anniversary unlikely to be celebrated by many. Of the numerous aid agencies that eagerly sought to establish a humanitarian foothold in the DPRK in 1996, few have made any effort to respond to this summer’s flood aid appeal. Of course, much has changed since widespread famine elicited the world’s altruistic sympathy two decades ago; North Korea’s defiance of international human rights campaigns and sanctions aimed at its nuclear weapons and missile programs has eroded the world’s willingness to extend such sympathy. Inter-Korean relations have deteriorated to a dangerous level, poisoning the atmosphere for any meaningful dialogue or negotiation. In the context of high tensions on the Korean peninsula, it may be surprising that the one organization celebrating this 20th anniversary is South Korean. The Korean Sharing Movement (KSM) is perhaps the most influential and broadly based South Korean NGO focusing on North Korea. It was formed in 1996 by prominent religious and secular groups and individuals, many of whom had been active in the South’s democratization movement. This year, KSM published a 580-page “20th Year Whitepaper,” and hosted what has become an annual conference of international humanitarian NGOs, UN agencies, foundations and regional governments that still engage with North Korea. I must admit that I have a strong professional and personal affinity with the vision of this organization, and I like its homespun name. The words “humanitarian” and “aid” suggest a one-direction charitable impulse. However, I am convinced that two decades of stubborn insistence on the moral imperative to share have changed the humanitarian landscape—indeed, more than is currently visible. The past 20 years have shown that “sharing” is far more complicated than the transfer of resources from the altruistic rich to the grateful poor. The twists and turns of the labyrinthine inter-Korean relationship continually buffet every sharing incentive, alternatively promoting and disrupting the flow of goods and human contact. We normally think of humanitarian aid as a one-way flow of resources from those who give to those who receive. When we speak of charity or benevolence, we imagine the virtuous generosity of individuals who drop coins in a beggar’s cup, or feed a neighbor out of the goodness of their hearts. And we expect gratitude on the part of those who have thus been gifted. Donor agencies want acknowledgement of their gifts, a recognition of their moral integrity. An ongoing complaint by donors to North Korea is that the DPRK has not shown the expected gratitude for their generosity. In many cases, especially when donations have come from South Korea, North Korean authorities have infuriated donors by removing Korean-language labels from donated sacks and packages. As Head of the UN World Food Programme’s Food Aid Liaison Unit in Pyongyang during the late 1990s, one of the most urgent tasks I had to perform was ensuring that beneficiaries of aid could identify the names of donor agencies. But the concept of sharing is not unidirectional. When we share something with others, we acknowledge that what we share belongs equally to both of us. The sharing of resources implies common ownership of those resources. Humanity shares this planet. We share the air we breathe. We share our human DNA. We share the community we live in, whether family, village, country or ethnic identity. We share a common history. We share our religion. We share language and culture. We engage in shared projects. We can have shared visions of our common future. And ultimately we will share humanity’s fate. Sharing not only takes place within a community, it also defines a community. A community that does not share has forfeited its communal nature. Refusal to share is a sign of brokenness. The demilitarized zone that cuts across Korea is meant to prevent the outbreak of war, but for over 60 years, it has also prevented sharing. As such, it is a monument to the brokenness of the Korean nation. After the collapse of the Soviet Union in 1991, the term globalization became increasingly popular. It was assumed that human history would inevitably shift towards an ideologically unipolar world, dominated by liberal economic forces. The American political economist Francis Fukuyama went so far as to proclaim the “end of history.” His argument was that the worldwide spread of liberal democracies and the Western world’s free market capitalism signals the end point of humanity’s sociocultural evolution. The neoconservative tendency to depend on market forces to regulate the distribution of wealth led to a worldwide rejection of the values inherent in sharing. Philanthropy by the rich: YES. Fairly and justly sharing global resources within the human community: NO. However, market forces have not stabilized our world economy. On the contrary, the unregulated nature of globalized competition has fractured our global community, producing a tiny club of the insanely rich who claim exclusive ownership of most of the world’s resources. Meanwhile, the majority of the world’s population are forced to battle over crumbs off the table of the world’s economic aristocracy. Viewing the Korean divide from the perspective of sharing offers some tantalizing conjectures. Could the extreme animosity directed against the DPRK have something to do with the fact that they have resolutely refused to join in the globalization project? Are we fascinated by the growth of unregulated markets in North Korea (jangmadang) because we see in them as the seeds of a North Korean “end of history?” Could South Korean attitudes toward North Koreans (whether toward those in power or those who have defected) have anything to do with feelings of guilt at having amassed so much wealth with the help of foreign powers, while their North Korean counterparts have been condemned to a life of penury? Does the idea of sharing resources with North Korea touch a moral wound that refuses to heal? Is the controversial idea of sharing at the heart of the numerous disagreements that have periodically erupted between South Korea’s NGOs and government authorities over the past 20 years? Unfortunately, refusal to share has also been the bane of the humanitarian community worldwide. Aid agencies have not escaped the juggernaut of cultural transformation imposed by the ideology of globalization. Competition, not cooperation, has become the hallmark of humanitarian operations. Whenever and wherever needs arise across the globe, hundreds of aid agencies compete for scarce humanitarian resources. This has resulted in agencies regarding each other with distrust, withholding information, participating in “turf wars” and squandering money on duplication of efforts. In the Korean case, the most obvious and bitter divide has been between humanitarian and human rights organizations. Humanitarian groups garnered the bulk of available money during the first ten years (from 1996 to 2006), but that changed over the next decade, after North Korea announced it no longer required food aid. From that point onward, the United States and European countries de-emphasized the “carrot” of humanitarian aid in favor of the “stick” of pressure over human rights. Moreover, given the severity of the conditions inside North Korea, other divisions among aid organizations arose. From the beginning, international NGOs resident in the DPRK tended to look down upon non-resident NGOs. Governmental and inter-governmental organizations often regard NGOs in general with suspicion. South Korean NGOs have had an additional handicap: international NGOs shun them for fear that such relationships could damage access to North Korea. All of this is compounded by a fierce competition for funds and recognition among NGOs within the ROK itself. Among this colorful and frustrating array of organizations, the Korean Sharing Movement stands out as a different sort of animal. From the beginning, it has set itself the goal of being cooperative rather than competitive. It is entirely appropriate to celebrate the 20th anniversary of KSM’s founding with fanfare. For me, KSM is not just an organization, but also a group of highly competent young men and women committed to the idea of sharing in the context of a world where sharing is penalized through sanctions. It values the sharing of information in a world where information has become a commodity to be hoarded. It values cooperation around shared goals to achieve desired results rather than feeding competitive self-interests. But sharing is a two-way street. Whatever we share or refuse to share changes who we are. When we refuse to share we forfeit our common humanity; we participate in division. When we share, we also become more self-aware, because we learn about ourselves from the reactions of those with whom we share. The refusal of the two Koreas to share has continually led their people to the brink of disaster. A lack of sharing not only prevents each side from understanding the other, but also prevents them from understanding themselves. The international humanitarian community initially thought that helping the DPRK deal with its famine would open North Korean society to the outside world and therefore lead to more “normal” relationships. It was a realistic hope, and it might have succeeded. Unfortunately, geopolitical interests and regional conflicts demolished that hope. At the end of the food crisis, we hoped that shifting from food aid to development cooperation would provide a new stimulus for inter-Korean and international rapprochement. Again it was a realistic hope, but repeated nuclear and missile tests and punitive sanctions short-circuited that ambition as well. In view of the dramatically increased tensions between the Koreas on this 20th anniversary of humanitarian involvement with North Korea, I am more than ever convinced that sharing—understood in the reciprocal, mutually reinforcing manner described above—remains the only viable option for pursuing a peaceful future for both Koreas. Achieving this future is the most difficult challenge on the Korean peninsula. Selfless sharing—not only of resources, but also of pain and sorrow, yearning and hope—is the first step on the road to reconciliation. Emiko Jozuka. “North Korea makes rare public appeal for flood relief.” CNN, September 15, 2016. http://www.cnn.com/2016/09/12/asia/north-korea-floods-admission/. Internationally, the great power competition among China, the United States and Russia repeatedly impacts the economic, military and diplomatic atmosphere on the Korean peninsula. Powerful ideological impulses are nurtured continuously by traumatic historical memories, keeping both Koreas locked in a dysfunctional dance. 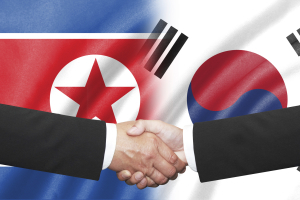 Despite the many instances of progress that periodically raise hopes for rapprochement, both Koreas seem to have succumbed to a culture of negativity that recoils with deep skepticism from any sign of blossoming trust or reconciliation. My own humanitarian entry into North Korea took place on behalf of another cooperative venture. The Food Aid Liaison Unit that I headed in Pyongyang from 1997 to 1999 was an operation serving a consortium of international NGOs. FALU and KSM have some overlapping history; the Musgrove conferences held in the United States in the mid-1990s helped to inspire the creation of both organizations, and KSM’s annual conference of humanitarian organizations active in the DPRK is a continuation of the type of meetings originally started by members of the FALU Steering Committee.